During the fall and winter months, these cookies make the perfect after-dinner accompaniment to any meal. With their light, cake-like texture, full flavor, and sweet glaze these cookies offer an enjoyable alternative to pumpkin pie. In fact, with the addition of the maple syrup and Jack Daniels I would argue that these cookies are almost better than a traditional pumpkin pie… I wonder how bacon would taste with these (that’s probably overkill though). 2. Combine flour, dry baking powder, baking soda, cinnamon, nutmeg, cloves; set aside. 3. In a medium bowl, cream together the ½ cup butter, granulated sugar, maple syrup, and Kosher salt. 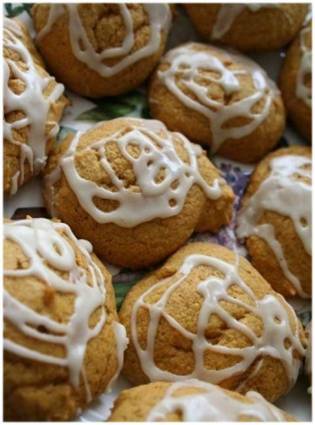 Add pumpkin puree, egg, and 1 teaspoon vanilla to the butter-sugar mixture, and beat until creamy. 4. Divide dry ingredients into thirds, and mix thirds into the batter one at a time. Make sure not to over mix the batter, as this will produce excess glutens making your cookies chewy and tough. 5. Spoon batter onto an un-greased cookie sheet by tablespoonfuls; flatten slightly. To make glaze: combine confectioners sugar, 1 tablespoonful water,1 tablespoon melted butter, and 1 teaspoon vanilla. Wisk ingredients together until they assume a quasi-liquid consistency. Drizzle glaze over cookies immediately.